Ask a Toxicologist: Is it safe to use Teflon pans? Is it safe to use non-stick frying pans and cookware? Before I answer, let me give a quick overview of how us toxicologists approach these kinds of questions. Hopefully, then you can follow a similar procedure and determine for yourself the health risks of other products! 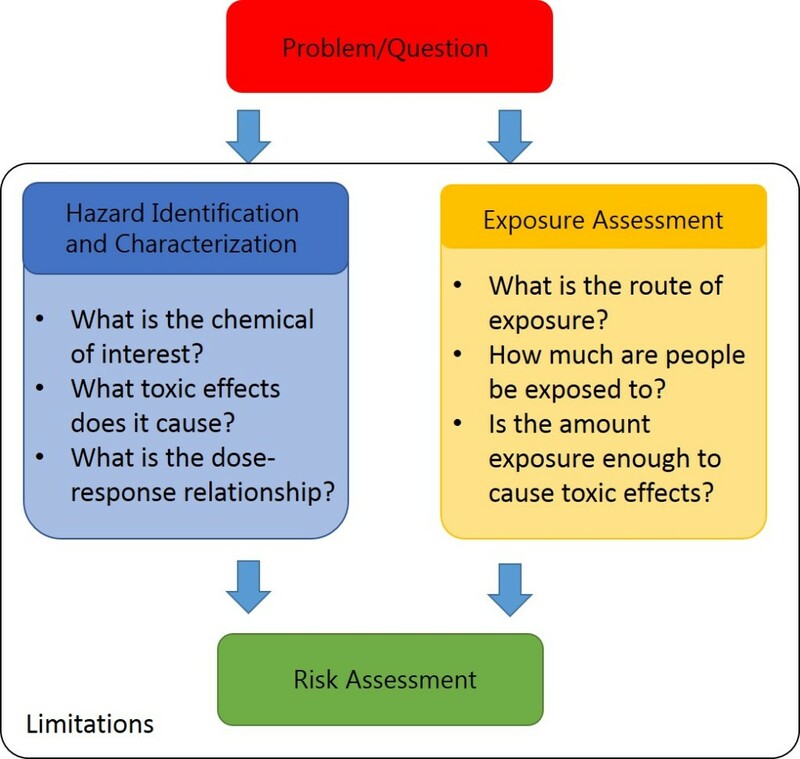 When assessing safety of any chemical or component, there are two types of information that needs to be gathered: hazard characterization and exposure assessment. In other words, what is the toxic compound and what toxic effects might it cause (hazard characterization)? Then, are people exposed to the compound? If so, how does it get into the body? And how much? Is the amount people are exposed to enough to cause harmful effects (exposure assessment)? Toxicologists design experiments to generate these two types of information. Integrating these pieces of information allows us to make our best estimate of the risk of chemicals being toxic to humans, a form of risk assessment. These are only estimates since much of this information is sometimes difficult to obtain practically (you can’t expose humans to potentially toxic compounds in a study!). Thus, we must rely on animal studies, testing individual cells, and computer models. Now, lets apply this method to non-stick pans. What makes pans non-stick? What is the potentially toxic component? The most common non-stick coating used to coat pots and pans is Teflon, a chemical mixture of perfluorochemicals (chemicals with lots of fluoride atoms). Developed by DuPont chemical company in 1938, these chemicals are extremely non-polar, meaning they do a very good job repelling other chemicals. As such, Teflon is used as an additive to paints, fabrics, carpets, and clothing. It is also used to treat materials to make them resistant to oils (like the inside of microwave popcorn bags). The primary chemical in Teflon, polytetrafluoroethylene (PTFE), has a high melting point (327 ºC), making it ideal for cooking applications. However, when heated to temperatures above 350 ºC (662 ºF), PTFE begins to degrade, releasing fine particles and a variety of gaseous compounds that can cause damage to the lungs when inhaled (Waritz 1975). What is the route of exposure? How are we exposed to PTFE? Inhalation of the PTFE-fumes from overheating a non-stick pan is one method of exposure. Since we use these pans to cook food, we might suppose that people could be ingesting PTFE, say if some of the coating gets into the food cooked in the pan. We want to estimate risk for the worst-case scenario so we will consider both routes of exposure. What is known about the harmful effects, or toxicities, of PTFE? Numerous case studies in the 1900s have documented flu-like symptoms after inhalation of PTFE fumes by workers in PTFE-using factories and by people overheating non-stick pans in the kitchen. This condition is called polymer fume fever, or “Teflon flu”, and presents with temporary, intense, but not serious symptoms such as fever, shivering, sore throat and coughing. These cases of Teflon flu are due to acute (short-term) exposures to PTFE fumes; no studies have been done looking at the long-term effects of brief, repeated PTFE-fume exposure, as would be the case in cooking using non-stick pans for a lifetime. Birds were found to be particularly susceptible to the PTFE fumes, based on some reports that pet birds were dying after their owners left a coated pan heating on the stove. Indeed, parakeets and Japanese quails died after exposure for 4 hours to PTFE fumes generated at 330 ºC (626 ºF). In summary, inhalation toxicity becomes a concern when PTFE is heated to high temperatures which releases toxic particles and gases that could result in polymer fume fever. These effects are more prominent, if not lethal, in birds than in humans. PTFE is inert in its solid form, meaning it won’t react with other chemicals, which is what makes it such as great non-stick coating. As such, the minimal PTFE you would ingest will likely pass through the digestive tract without harm. However, another fluorinated compound, PFOA (perfluorooctanoic acid), is commonly used in the process of making PTFE and may be residual in non-stick coating components. After repeated heating and cooling, it is possible that the PFOA could migrate into the food. Research suggests that PFOA interferes with hormonal balances as well as reproduction and fetal development. So if PTFE is the hazardous component, do non-stick pans generate these toxic PTFE-fumes when I use them in the kitchen? Typical temperatures for frying foods range from 130 ºC for fish fillets to 280 ºC for steak (266 ºF, 536 ºF, respectively) and the maximum temperature for most household ovens is 500 ºF. Given that PTFE degrades above 350 ºC (662 ºF), I would presume that the temperatures typically used to cook foods do not generate sufficient PTFE-fumes to cause polymer fume fever. Many of the case studies reporting polymer fume fever were results of unattended heating and of heating empty non-stick pans. Furthermore, most kitchens have reasonable ventilation that would protect the user. 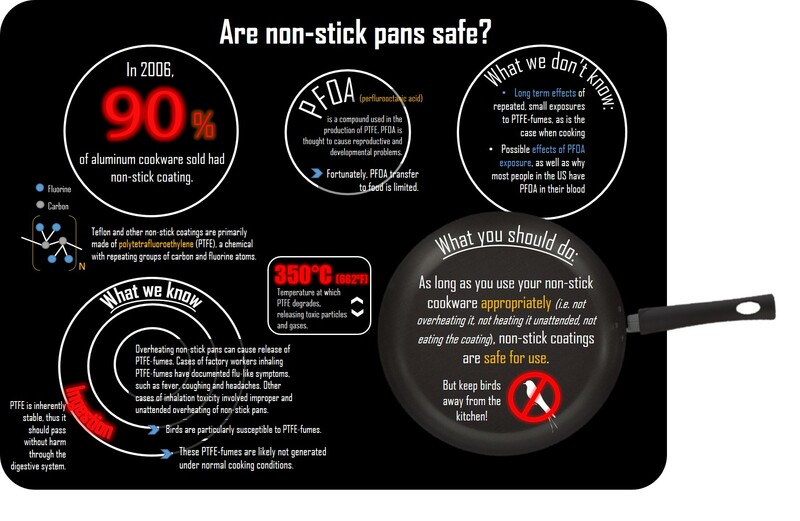 Altogether, non-stick pans could produce PTFE-fumes if used improperly. Typical cooking practices will probably not generate a significant amount of these fumes. What about PFOA? How much PFOA is there? How much PFOA comes from non-stick pans? While PFOA is used in the production of non-stick coatings, it is thought that there is minimal PFOA in PTFE. DuPont removed PFOA from Teflon production in 2013 as a part of the 2010/2015 PFOA Stewardship Program, an initiative by eight manufacturing companies organized by EPA to reduce PFOA emissions and use in production (EPA). PFOA is hard to degrade and it can remain in the environment and the human body for a long time. Thus, repeated exposure to small amounts of PFOA could build up over time and cause toxicity. In fact, PFOA has been detected in the blood of almost all US residents (Post). To determine how much PFOA could come from non-stick coatings, Begley and his team at the U.S. FDA designed an experiment to investigate the possibility of PFOA transfer from PTFE-coated pans to food. Using the most conservative estimates, they found that minimal amounts of PFOA transferred from PTFE cookware, even after intensive heating of the pans. Thus, it is more likely that humans are exposed to PFOA through other means than by ingestion of residual PFOA from food cooked in a non-stick pan. A very important section! All research has its limitations. We can’t measure everything, our tests aren’t perfect, and we can’t account for all the variables when designing the experiments. Thus, every risk assessment needs to identify and address the caveats. The biggest question that is not answered by research is the long-term effect of exposure to small amounts of PTFE and PFOA. This kind of exposure is more representative of how people come into contact with Teflon and its toxic components. In conclusion, to my dear newlywed friends and other interested readers, is it safe to use non-stick frying pans and cookware? Assuming you use your cookware appropriately, i.e. not heating it excessively and unattended, always heating the pan with something in it, not scratching off the Teflon and consuming it for dinner, using non-stick pans is relatively safe for humans. Risk of “Teflon flu” due to inhalation of fumes during typical kitchen use is minimal. Ingestion of PTFE is not reported to be toxic and residual PFOA in PTFE-coated pans is minimally transferred to food. However, long-term exposure studies to PTFE-fumes and PFOA have not been conducted so we can’t say that it is completely safe. Regardless, you should keep Larry the bird away from the kitchen. If you wish to avoid the Teflon risk altogether, stainless steel and cast-iron pans are recommended alternative, albeit not necessarily non-stick, cooking options. Disclaimer: The views and opinions expressed in this article are those of the author alone and are not intended for medical diagnoses/advice. They also do not necessarily reflect those of SWAC or the UNC at Chapel Hill.